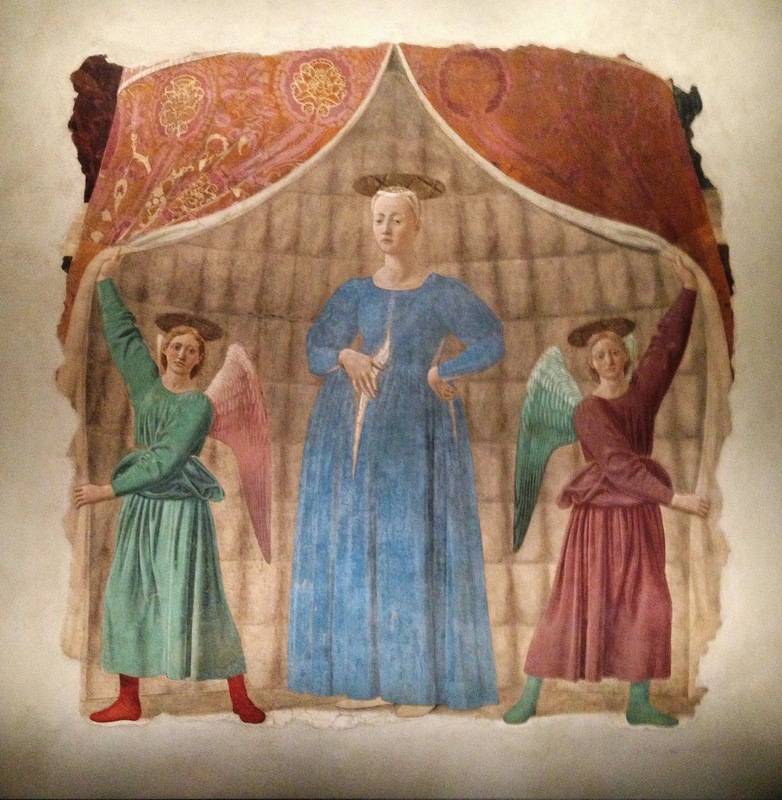 Detached fresco, 1467, 260x203cm., Monterchi. How extraordinarily blessed I felt to be honored with a completely private audience, no other (mortal) person there for more than an hour, with one of the world's handful of most beautiful paintings, in Monterchi: Piero della Francesca's Madonna del Parto. And I suppose I should say something about what the extraordinary beauty of this painting is to me, since to many people, that beauty may not be obvious at all: she's just a sort of confused looking woman with a stomach problem. I can say this, but saying it is as close to blasphemy as I'd ever like to come. Blasphemy doesn't have to be against theology; against empathy is more than enough, and there are few things worse than blasphemy against that, perhaps the most crucial of all human emotions. This is Mary, consumed with the attempt to realize the mystery of the child she bears; and that child is right there growing within her, as she shows us. No one has to be Christian to empathize with the enormity of that realization; and yet Piero emphatically was as Christian as any artist in history, and it thus meant that much more to him; yet there's not a trace in this painting anywhere of dogma or exclusion; pure empathy, and the absolute beauty of Piero's representation of it, to all of us.